What is the goal of Divest Whitman? What has Divest Whitman accomplished? Since its inception in 2012, Divest Whitman has carried out a dynamic campus campaign. The span of its activism includes conducting independent research, attending national climate conferences, coordinating with Whitman faculty and student government, and sponsoring rallies and actions on campus. In 2014, Whitman held a mock wedding between “Ms. Whitman” and “Mr. Fossil Fuels,” which was featured by the Associated Press and the local ABC station’s evening news. 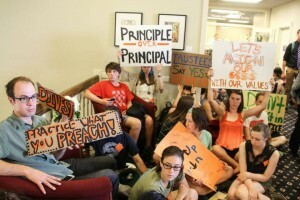 In 2015, Divest Whitman hosted a Climate March with 200 attendees, and a sit-in inside Memorial Hall during the spring Board of Trustee meeting with 272 attendees. That same year Divest Whitman passed three successful pieces of legislation: an ASWC resolution that calculated the financial implications of divestment and proposed a specific request, a faculty resolution with near unanimous support, and a student referendum with 85 percent of students voting in favor. A longer version of the group’s history can be read here. In the late fall of 2012, when the international divestment movement was just beginning and Bill McKibben had yet to go on his Do The Math tour, three Whitman students got together to talk about climate action. They were excited about events at other colleges and wanted to be a part of the burgeoning student movement to combat climate change. They took their ideas to a student group that had been organizing on similar issues– Campus Climate Challenge (CCC). The students already involved in CCC gave them the institutional knowledge and activist camaraderie they needed to launch their own campaign. Thus Divest Whitman was born but would remain closely tied with it’s parent group CCC. In January, four students met privately with David Nierenberg and Peter Harvey. Although the meeting itself was private, over 50 members of the Whitman community stood outside the door to register their support for divestment. At that initial meeting it became clear that getting Whitman to divest would need to be a multi-pronged effort; one in which board members and administrators were both important partners and targets for grassroots pressure. Divestment gained steam through the spring, as the campaign gained members and prepared for a visit to campus by Bill McKibben. McKibben’s speech culminated in a march organized by Divest Whitman that attracted 200 people. At the march, the president of ASWC publicly endorsed the divestment campaign. Later that spring, after holding its first-ever public hearing, ASWC passed a resolution in favor of limiting the college’s fossil fuel investments and creating a multi-stakeholder group to investigate full fossil fuel divestment. While waiting for a response on the resolution, Divest Whitman organized a letter writing campaign to President Bridges, encouraging him to support the divestment resolution. Letters poured in from students, faculty and alumni, which members of the campaign hand-delivered to the president Bridges office. Unfortunately, in February of 2014, the Board of Trustees issued a statement stating the college would refuse to consider even a committee researching divestment. 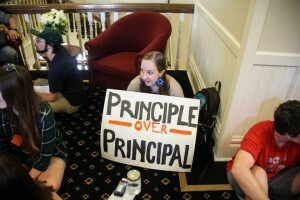 The campaign responded in kind, as well as with a tongue-in-cheek edit of the trustee’s letter. At this point, Divest Whitman began to escalate its campaign, building stronger faculty and alumni support as well as engaging the whole community with creative actions. The spring of 2014 culminated in a faux-wedding between Whitman and the fossil fuel industry that received coverage in local and national press and was even attended by some trustees. In September 2014, the campaign partnered with local groups Walla Walla Citizens Climate Lobby and the Walla Walla Progressives to hold a climate march. Then, after meeting one-one-one with nearly 100 faculty members, Divest Whitman successfully lobbied the faculty senate to pass a resolution nearly unanimously in favor of fossil fuel divestment. In the spring of 2015, a sister referendum put to student voters passed with 85% support, with turnout that exceeded ASWC elections. Divest Whitman members collaborated with ASWC to draft a new, stronger resolution advocating fossil fuel divestment that also passed through the senate with an overwhelming majority.